I’m not going to lie – I only got this book because of two things: The Book Smugglers review and Neil Gaiman’s praise was the first thing you’ll see at the back of the book. Okay wait, make it three things: the hardcover version was cheaper than the paperback version. I wasn’t sure what to expect from this book, but I was hungry for something contemporary over the weekend so I dug this out from the plastic bags that currently house my books. Junior has had a hard life. The book immediately starts with one of the things that has made Junior’s life hard, that he was born with water in his brain. Junior then narrates how unfortunate he was with his health, and how unlucky he was with the other things that white people take for granted because he is an Indian living on the Spokane Indian Reservation (simply called “rez” throughout the book). Despite all the unfortunate things Junior had to deal with in his life, however, it was very clear that there was something special about him, something that made him different from all other Indians in the rez. This was seen by his geometry teacher, Mr. P, who, after getting hit on the face by a Junior’s geometry book that used to belong to his mother, convinces Junior to leave the reservation and study somewhere else if he wanted to get ahead with his life. And so Junior leaves, with little resistance from his family and a lot from his fellow Indians. 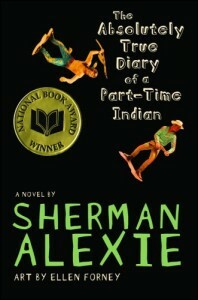 This is where Junior’s adventures start, as he becomes the first and only Indian to study in an all-white school. Junior believes the white people have it better than he does (and they do) and that they would be out to get him for being different (surprisingly, they weren’t). Here we see Junior punch a guy in the face expecting a fight but instead gets respect, “fall in love” with a girl who has her own problems, be a basketball star and do many other things that he never thought he would get to do because he was Indian. We also see Junior deal with racism from unexpected people, lose his best friend and experience deaths (yes, deaths!) and grief, yet he always bounces back somehow. I cannot help but compare this book to Stephen Emond‘s Happyface. They both have the same tone, the same quirky lead character, and artwork (even if Happyface is more artwork than text). However, in terms of problems, Junior definitely carries the bigger weight. Happyface is a victim of his circumstance while Junior is a victim of a fate that people before him had long determined. This is not to say that Happyface is shallow, though — his problems were totally legit. However, if you put them beside Junior’s, they definitely look smaller and more insignificant than what Junior had to deal with all his life. But maybe that’s also a lesson in perspective too. Some of us may be Happyfaces, some of us may be Juniors, but that doesn’t mean that one problem is lesser than the other. I think what matters more is how we deal with these problems and how we try to rise up from it. Because that’s really the most important thing, right? How we keep on standing up no matter how many times we fall, or no matter how many times others make us fall. Happyface just happened to live in a different kind of rez compared to Junior, IMHO. The Absolutely True Diary of a Part-Time Indian teaches us that there is more to life than what we know of our own reservations, be it figurative or literal ones. Junior said it quite well: “Reservations were meant to be prisons, you know? Indians were supposed to move onto reservations and die. We were supposed to disappear. But somehow or another, Indians have forgotten that reservations were meant to be death camps.” This book teaches us that we must not be satisfied to stay within our own death camps, and hope that we find enough courage, arrogance and craziness to leave them. I ADORE this book. Definitely one of my faves in YA — I’m glad you liked it, too. Great review! I think I might like this. I truly believe that we shouldn’t set boundaries -or Reservations, as Junior puts it- to ourselves. Inhibitions, that’s what I’m trying to shake out of my system. I’d say that I’m successfully(a bit) doing that but I could still use some reminders such as this book. Adding it on my radar. Dang! My 2011 reading list is dominated by contemporary YAs!!! This is such an entertaining and moving book. I loved it immediately and I’m glad you resonated with Junior, too. Wow, 5 stars? That’s great! I forgot about the drawings in this one. And I’ve never heard of Happyface, but I guess now I have to see how they compare.